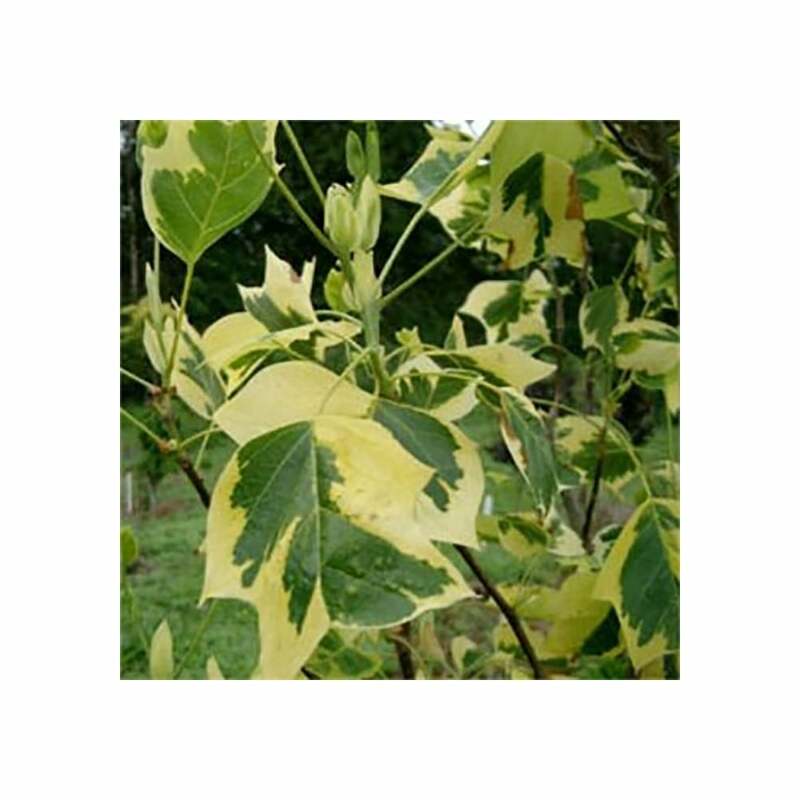 A lovely interesting tree with attractive, unusually shaped large leaves that have a creamy yellow margin and turn a good yellow colour in autumn. Liriodendron tulipifera ‘Aureomarginata’ produces yellow and green tulip shaped flowers in June-July on older trees. This variegated form of Tulip tree will grow to a lesser height than the straight forward Liriodendron tulipifera and will reach 6 x 4 meters in 20 years. ‘Aureomarginata’ will do well in any sunny or semi-shaded position that isn’t dry, on well-drained soil and is tolerant of wind exposure. Our pot grown Variegated Tulip trees can be planted at any time of the year. Start by removing weeds and grass within a metre of your desired planting hole. Dig a square hole as deep as your root mass and roughly 2x as wide. To help the tree establish, sprinkle root grow in the hole. Remove the pot, gently loosen the roots and place into the planting hole. Mix 50% of the original soil with 50% compost, fill in the hole and firm around gently. Avoid banking the soil up around the collar of the tree. We recommend planting Variegated Tulip trees with a stake and tie to ensure the roots are well anchored - instructions are in the planting guide. If you’re planting Variegated Tulip trees in spring or summer, water well for the first few months. Increase watering if there are extended periods of hot or dry weather. If planting in autumn, you may only need to water a little. Variegated Tulip trees do not require regular pruning. If you wish to tidy it up, do so in the dormant season. Focus on removing damaged, diseased or overcrowded branches. If you require a clear trunk, remove side shoots to raise the crown.